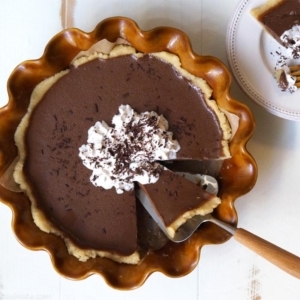 A truly authentic tasting French Silk Pie made without eggs, dairy, or soy! Line a pie pan with parchment paper. To prepare the crust, combine all of the ingredients in a mixing bowl and stir well to create a sticky batter. Transfer the mixture to the lined pie pan and use your hands to press the dough evenly up the sides of the pan, creating a crust about 1/4-inch thick. This dough is very sticky, so I recommend getting your hands wet with water to help press out the crust-- wet hands won't stick to the dough! Set the pan in the freezer to set while you prepare the filling. To prepare the chocolate filling, combine the coconut milk, agar flakes, vanilla, and coconut sugar in a saucepan over medium-high heat and bring the mixture to a boil, stirring constantly with a whisk to help everything dissolve. Reduce the heat to a simmer, then add in the baking chocolate and a pinch of salt and continue to whisk the mixture until it's smooth and has a rich chocolate color. Remove from the heat and allow to cool for 5 minutes. Remove the pan from the freezer and pour the filling into the prepared crust. If you're impatient like me, place the finished pie back in the freezer to speed-up the cooling time. You don't want the whole pie to freeze, so I only keep it in the freezer for an hour and then I transfer it to the fridge for another hour before serving. If you're not in a hurry, place the pie in the fridge to set for 4-6 hours, or overnight. Before serving, top the pie with coconut whipped cream and chocolate shavings. (You can make the chocolate shavings using a vegetable peeler!) Serve chilled, because the crust will get soft if left at room temperature too long.